We’ve made significant changes to the PKB lab results page (Health > Laboratory) because we believe the new layout is better for patient safety. 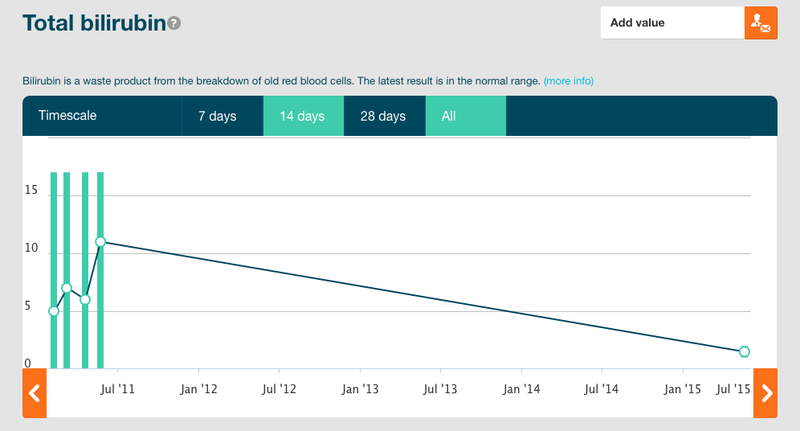 Instead of only displaying the latest test result without showing the date of when it was taken, we are now displaying an overview of test results. This overview is beneficial for two reasons. It gives a more accurate view of a patient’s lab history. 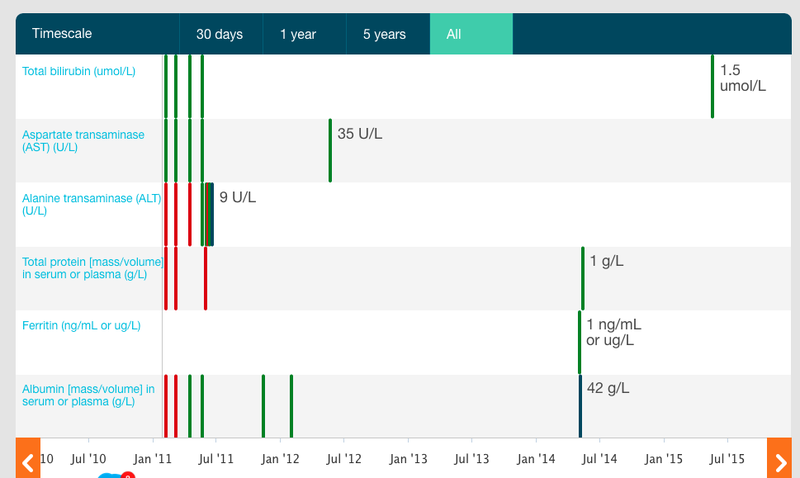 If a patient shows his clinician this lab results page, he can immediately see the latest result in context of the patient’s test result history. So instead of determining next steps for the patient based on the latest test result – which may have be from five years ago – the clinician can make a more accurate diagnosis based on the current status of the patient. It shows which tests were done on the same day. The test results are grouped by test categories (i.e infection diseases or liver function tests) and within those categories are multiple tests that are often taken together. By showing which ones are taken on the same day and which ones are not in the overview, clinicians can quickly distinguish which tests are missing or comprehend a combination of test values for a diagnosis. So how do we make sense of the display? Let’s use this screenshot of a particular category to walk you through how to read this. Green bars mean that the data value was within range. Red bars mean that the data values was out of range. Blue bars mean that a range was not specified. So for this patient, it looks like his albumin level (the bottom row of this category) was out of range earlier in his life, and quite normal within range later on but his last test didn’t have any range values to tell us whether his test was within or out of range. The bars that line up are tests that were done on the same day. The values that you see on the right is the latest test result value. We see 1.5 umol/L as the value of the latest total bilirubin test that this patient took (top row). Did that make sense? If not, clicking on the test name like total bilirubin will bring you to original display that you’re familiar with. This adds up to patient safety because we’re working towards displaying a patient’s test result in a clear and comprehensive fashion to reduce possible clinical diagnostic errors. Of course, we are constantly making improvements to the user experience based on feedback, but we wanted to present a first look for the benefits of our patients and clinicians.